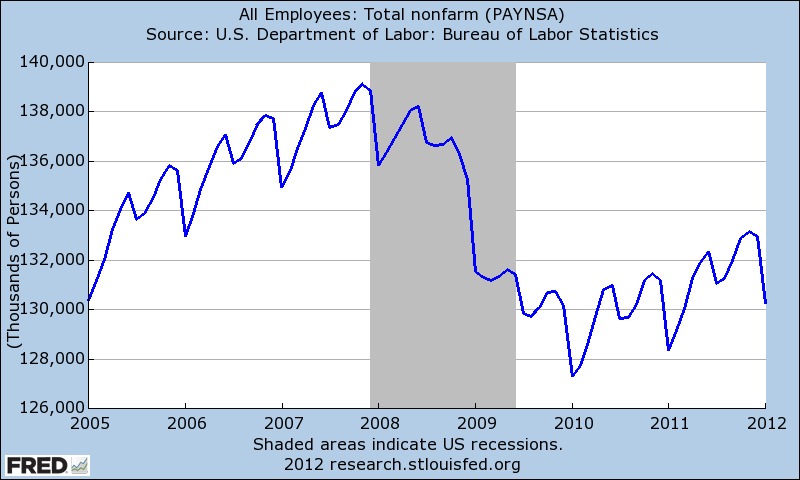 Minus the discretionary “seasonal adjustment,” the economy actually shed 2.7 million jobs in January. 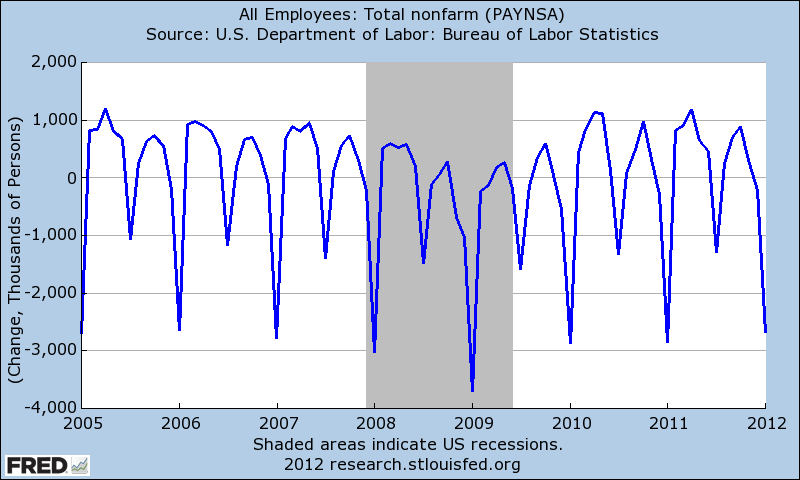 The seasonally-adjusted (SA) Nonfarm Payrolls number does not measure the actual number of jobs created or destroyed. The SA number instead measures what total employment WOULD BE if it weren’t July or January. And it’s important to note that much of the seasonal adjustment process occurs based on the discretion of government statisticians. Who couldn’t possibly be under pressure to produce evidence of a stronger economy during a presidential election year. No way. If the economy were adding jobs and more people were working again . 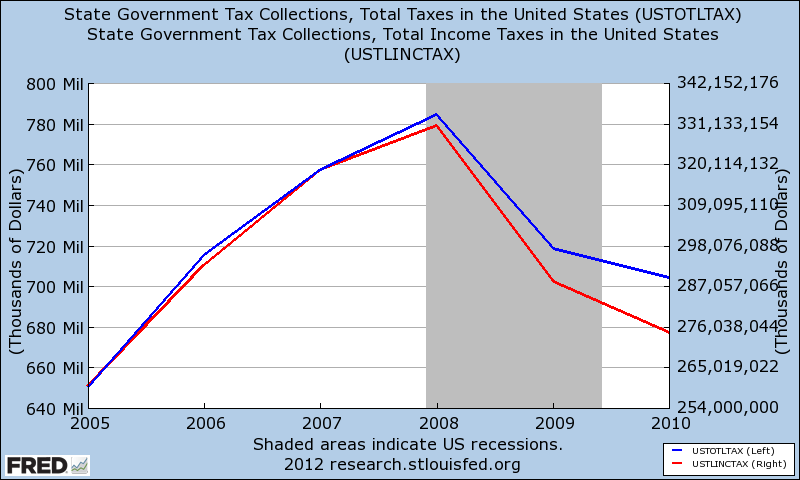 . . shouldn’t the states be collecting MORE total taxes, especially income taxes? Maybe we should start seasonally adjusting more data, so these annoying divergences — that make absolutely no sense — would be harder to document. Further notice in the above graph how Total State Income Taxes are falling faster than Total Taxes, which suggests FEWER people are working and paying Income Taxes, not more. But my question is: Does the “audience” that trades and invests based on the discretion of government statisticians understand the rules? Do they even pay attention to the rules? And if they could only choose one, would they choose a.) accurate data or b.) the increasingly-addictive rush of dopamine associated with another triple-digit gain in the Dow? Unquestionably consider that that yyou said. Your favorite reason appeared to be on the net the easiest hing to have in mind of. I say to you, I definitely get annoyed while other folks consider worries tthat they plainly do not know about. out the whole thing without havging side-effects , other folks can take a signal.